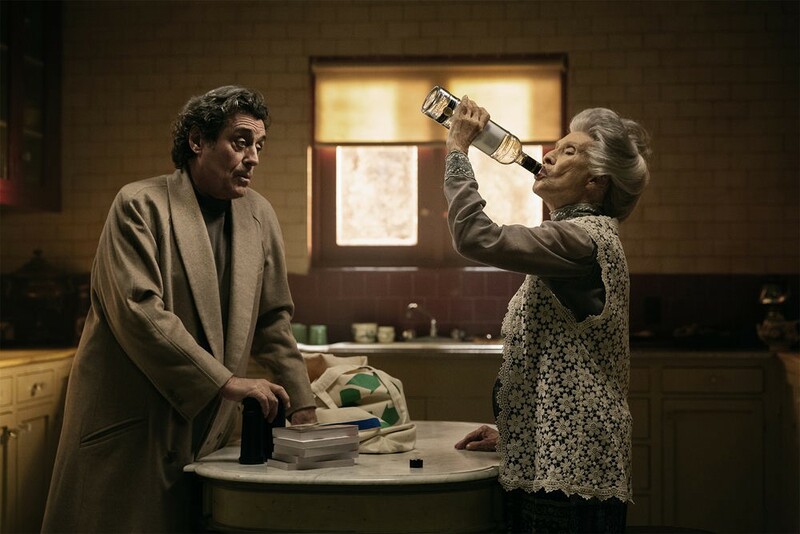 If last week’s premiere of American Gods wasn’t enough to prove that this show isn’t like your usual show in terms of episodic plots, character, pacing, or arcing story, then welcome to episode two! “The Secret of Spoons” brings to us: several character introductions, a protagonist who thinks he’s losing it, and checkers as a big finale. It’s clear that American Gods is playing for the long term and isn’t shy about it — in fact, this episode seems to revel in the epic, meandering pace it has set for itself even more than the previous one. Sequences without dialogue, seemingly pointless dialogue, or things that only raise more questions — all of it works to set a mood. For some, that mood is probably simple confusion. But that’s pretty fitting when one considers the current mental state of our protagonist, Shadow, who is likely just as confused about everything happening around him as we are. At least we occasionally get flashbacks courtesy of Mr. Ibis to tell us that gods are real and powered by belief. Poor Shadow Moon just gets abstruse instruction from Mr. Wednesday, assaulted and almost hanged, and threatened by a hammer-wielding chainsmoker over a game of checkers. Though Anansi fulfills his role as a storyteller, the story he tells is not one of the clever tales he spins in legend that allow him to slip harmlessly out of danger, but one of three hundred years of tragedy, horror, and inequality. I can’t actually quote most of the speech Orlando Jones gives as Anansi in this “Coming to America” scene because the highlights include words that I’m not allowed to use here on Just About Write, but know that the entire thing is absolutely incredible in both content and delivery. Anansi is justifiably angry about the future of the people who worship him in America and he stokes the anger in those around him. He tells them that they can “die a sacrifice for something worthwhile” by setting the ship they — and the slavers — are on ablaze, destroying it before it ever reaches land. Anansi breaks their chains and they are suddenly free to do just that. The ship burns at sea and, presumably, leaves no survivors. Except for a curiously colorful spider, which crawls ashore in America. Shadow’s story starts right after it left off, post-lynch mob and the utter annihilation of that lynch mob by some unknown, unseen, unearthly-strong protector. Since the kid in the limo mentioned Mr. Wednesday in his over-the-top speech about deletion and reprogramming reality, Shadow figures Wednesday must have something to do with him almost getting murdered — or, at the very least, being employed by Wednesday has exposed Shadow to people who want Shadow murdered for associating with him. Regardless, Shadow is extremely upset and wants an explanation from Mr. Wednesday. Mr. Wednesday, as ever, uses twice the number of words to impart half the requested knowledge. All Shadow knows for sure is that he’s now involved in something huge and dangerous, and that attacking Shadow to get to Wednesday is a great way to make the old one-eyed con artist angry. Also, his salary has been doubled. That’s nice? The next day, Shadow goes to the house he shared with Laura before being sent to prison to clean out her effects and gather what he wants to keep. As soon as he steps through the door he sees the decorations that are still up for his welcome home party. He imagines Laura standing in the kitchen and sleeping on the bed, before the reality of her absence returns to him. Shadow gets to work boxing up all Laura’s things, cleaning the house, packing his own clothes — all while the box full of the personal items that had been on Laura’s body when she’d died seems to loom at him from its spot on the bed. Eventually, Shadow gives in and opens the box. He takes Laura’s wedding ring out of the plastic evidence bag, then removes her phone and goes to the last messages she exchanged with Robbie. Maybe Shadow was feeling self-destructive, or maybe he hoped there’d be no evidence of the affair Audrey had spoken of — either way, he sees exactly what he didn’t need to see. As he finishes cleaning the house, Shadow is so distracted by his hurt and anger that he scrapes his fingers raw while scrubbing the bathroom floor and doesn’t notice until he’s bleeding. The entire sequence of Shadow in the house imagining, packing, and cleaning is done entirely without dialogue and with abrupt close-ups to things like bloody soap suds and taped boxes. The silence adds to Shadow’s contemplative emotions and allows Ricky Whittle’s acting abilities to shine through spectacularly, while the editing of the scenes makes things feel as surreal and disjointed as Shadow must feel. When everything is packed and Shadow’s life as he knew it is truly over, Mr. Wednesday announces that they’re going shopping and then stopping in Chicago on the way to “one of the most important places in the entire country.” On the journey to Chicago, there’s more driving footage (which I still love) and some of the coin trickery that I haven’t discussed in a review yet but basically, Shadow has a habit of doing magic tricks with coins. As do a few others, like Mad Sweeney in the previous episode and Mr. Wednesday in this one. Both Sweeney and Wednesday have done a trick where they flip the coin into the air and it disappears before coming down again. Both times, Shadow is amusingly bewildered and frustrated. While shopping for all the things on Wednesday’s list, Shadow ends up in the TV aisle of a store and, to his surprise, Lucille Ball as Lucy Ricardo is speaking to him through one of the televisions. Lucy — or Media, our second introduction of the episode — apologizes to Shadow for the actions of Technical Boy, a.k.a. the kid in the limo who almost had Shadow killed. Media wants very much for Shadow to be “in [their] camp” but Shadow gets no clarification on what this means, or why camps exist, or why he’s wanted at all. Asking Wednesday what’s going on only yields more unhelpful advice for Shadow, who is panicking at the thought of going post-prison crazy. Flying out of a limo and seeing digitized people can be explained away as hallucination. Disappearing coins are just magic tricks. But Lucy talking to him through a TV? That’s, as Shadow puts it, “weirder by several orders of magnitude than anything that’s ever happened to [him].” Wednesday’s response? “So far.” He does arrive at a specific decision that Shadow must make, though: choosing to believe that he’s crazy, or choosing to believe that the world is. I love the way Ian McShane and Ricky Whittle play their characters individually, but the magic is really in how they play them together. Shadow is equal parts mystified, angry, and exasperated by Wednesday’s cryptic words and seemingly random behavior; Wednesday seems both genuinely concerned about Shadow’s well-being and perfectly capable of pushing him into mortal danger without hesitation. It’s an interesting dynamic that’s greatly enhanced by the actors. Wednesday’s shopping list is for his friends(?) in Chicago, a family of three sisters and an ambiguously related man named Czernobog. The sisters — we’re introduced to two of three, but mostly to Zorya Vechernyaya — tell fortunes and Czernobog slaughters cows for the meat industry. Both Shadow and Wednesday are invited to dinner, though Czernobog seems furious at spending an evening in their presence. Mostly because of whatever Wednesday wants him to participate in, which isn’t clarified exactly but does involve a lot of death. Whatever interest Czernobog has in the death (and it’s a lot, if the way he talks about smashing cows’ skulls in with hammers is anything to go by) is outweighed by his concern for himself and his wish to stay out of Wednesday’s scheming. Czernobog asks Shadow if he knows how to play checkers, which he does (“I was in prison for three years.”) and then challenges him to a game. After a few turns, Czernobog gets up to show off the hammer he used to use to kill cows. Shadow is clearly uneasy, even before he starts imagining blood dripping down the hammer’s handle. Czernobog seems to be having fun talking to Shadow about how great it is to kill things at sunrise and laughs before offering a wager: if he loses, he agrees to participate in whatever Wednesday is planning. If Czernobog wins, then he gets to smash Shadow’s head in with his hammer. A brief discussion ensues, with Wednesday telling Shadow that the choice — like the choice to be mad or accept the world’s madness — is completely up to Shadow, and no one else. Shadow, although he doesn’t know what Wednesday is planning, knows that Czernobog is somehow important and that it might be time to choose a mad, mad world. He agrees to the terms. We get another sequence without dialogue as the two play their game. Not sure if it’s intentional, but I think Laura’s phone says a lot about her: a generic background wallpaper and a series of generic starter apps, like a notes app and a clock. Basically, the apps most people either delete from their home screen or add to a different page of it. No games, no personality, no indication that she used the phone as an extension of her life, the way most people with smartphones end up doing. Wednesday flirting with Zorya Vechernyaya, though. I hope Bilquis gets to be a bigger part of the story soon so I can actually talk about her, since they’re clearly doing something interesting with her character but even I don’t know what’s going on yet, beyond the obvious: Bilquis, even while regularly participating in her personal form of worship, is not a happy goddess.